Toffee Apples – Pink Lady Style! It’s the run up to Halloween weekend, and a great time to spoil your family and friends with sweet treats. 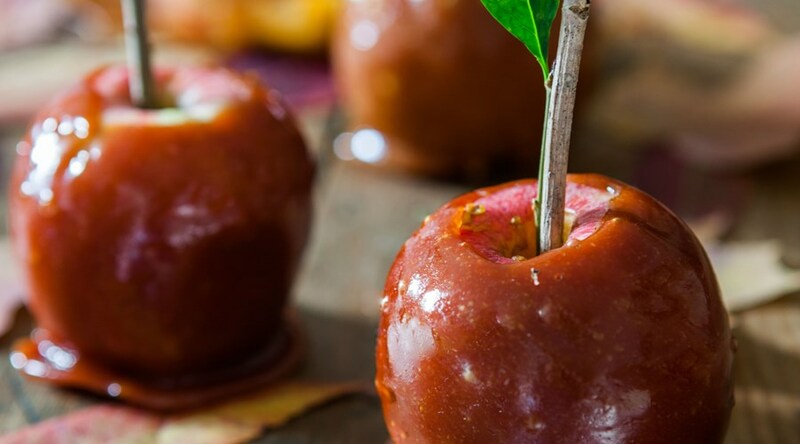 Here’s a great recipe to get started – Toffee Apples – Pink Lady Style! Place the Pink Lady® apples into a large heatproof bowl and cover with boiling water. Leave for a few minutes, as this will help the sugar syrup stick better. Remove the apples and dry with kitchen paper. Remove the stalks of the apples and push the wooden sticks through the top to create the handle. Measure out all of the ingredients and put them all (except the apples) into a medium heavy-based saucepan with deep sides, as you will need to tip to the saucepan to the side while dipping the apples into the sugar syrup. Line a baking tray with parchment paper for when the apples are ready. Heat the sugar mix on a medium low heat and let it bubble away for a good 10 minutes. The most accurate way to know when the sugar syrup is ready is to use a cooking thermometer; you want the sugar syrup to reach 143 -150°c. Or alternatively if you do not have a thermometer you can place a small amount of the mixture into a bowl of cold water and if it separates into threads that are hard but not brittle, then it is ready. Once the sugar syrup has reached 143-150°c, turn off the heat and keep stirring to remove all the bubbles and to cool it down slightly. If the sugar syrup is too hot then it will run off the apple so you need to wait until the mixture looks like syrup with no bubbles, which is around 120°c. Carefully place your apple with the wooden stick into the sugar syrup and tilt the pan to get best coverage for your apple. Keep rotating the apple in the mix to coat. Hold the apple above the pan and keep rotating until the sugar cools and holds its shape better. When you think its holding well place the apple onto the lined tray to cool. Repeat the process with the remaining apples.